Please note: almost everything I ever write is wrapped up in two pages. Today’s story got carried away. Hang in there. October is Breast Cancer Awareness month. It is also the month I was diagnosed. Five years ago. It seems like forever and it seems like yesterday. So much changed that fateful day. They say hindsight is 20/20 and looking back after the diagnosis certainly made everything clear. For me the cancer was insidious, sneaking in slowly, so slowly that when the fatigue and need for naps was explained away as just part of nearing 50; the shortness of breath was just the darn altitude in the mountains and being out of shape. It was easy to excuse everything. Like the temperature balls in a Galileo thermometer my priority list rises and falls. Interestingly, I had an order for a mammogram given to me more than six months ago at my last visit. I went because my hands were bothering me and the doctor thought it was probably early arthritis for which she prescribed an anti-inflammatory and ordered an xray. She also suggested that it was time for a screening mammogram. Even with no family history she thought all women over 40 should have that first check. 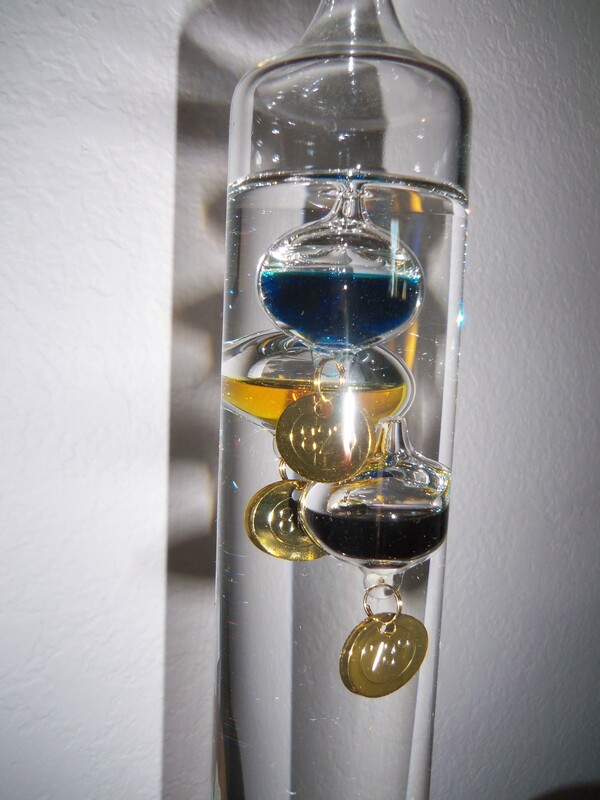 Well…priorities… Life for me is like a Galileo thermometer. Priorities bubble up to the top and only those that make it to the top are worried about. 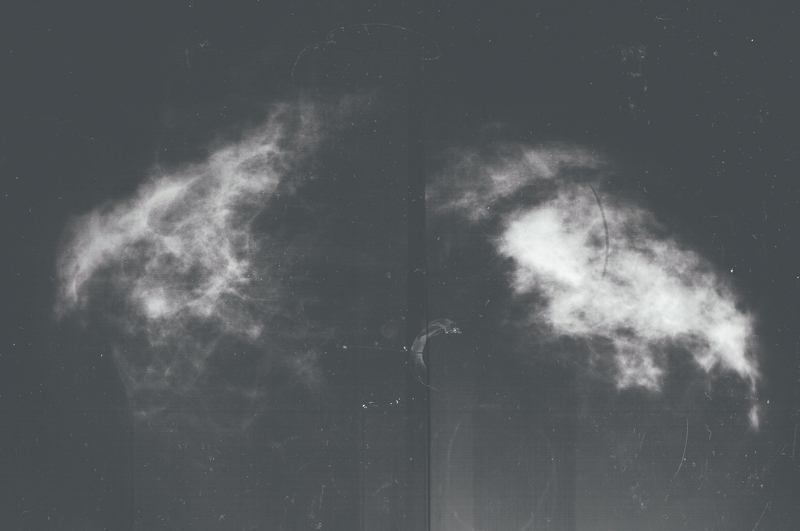 As a caregiver scheduling that mammogram just never rose to a top priority. I carefully filed those orders away. Lesson learned: Just because you are a mom or a caregiver to someone else doesn’t mean you can let your own health slip. Don’t put it off. Don’t be like me. So I had the mammogram. Let me tell you that, as a former mammographer I already knew what the xrays would show. And when the radiology office called to tell me to get in ASAP to see my doctor I was doubly sure. Within three days of my ‘awakening’ I was in the doctor’s office where she said, “I have your xray report. Yes, you have a little arthritis in your hands BUT THIS and she pointed to the one inch mass…” then she went on to tell me that I needed to go back to the radiology office for more tests and then to a surgeon. My priority bubble had shifted suddenly. Warning: these are my real insides. You don’t have to be an expert to see the picture on the right looks a lot different from the one on the left. The next month changed to getting a diagnosis. 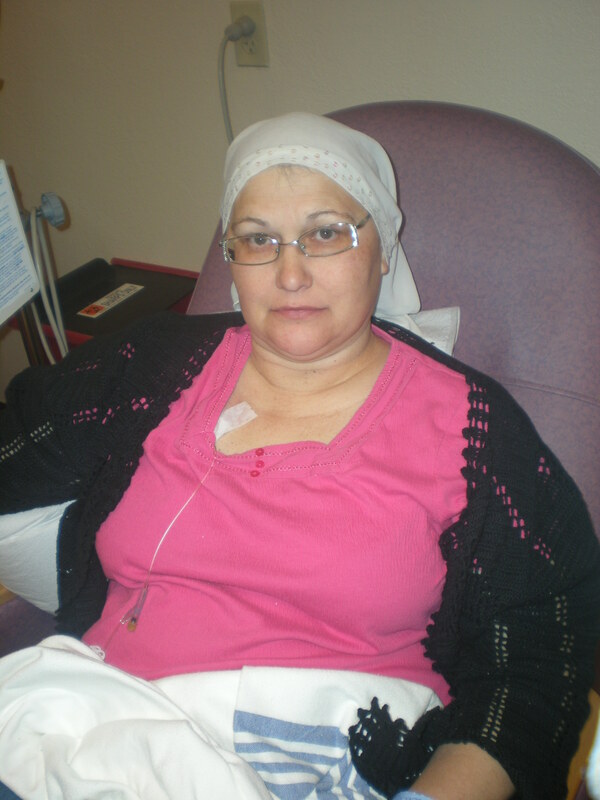 Ultrasound, needle biopsy and surgery were scheduled as I had the most frightening disease. First you get the diagnosis and then the staging. It’s quite a pace changing situation. Hurry to get one thing scheduled, then wait impatiently for the results knowing that if A happens you go on to the next step but if it’s B then there’s another detour while everything is evaluated and then you start all over again. As an aside, all of my doctors pushed for expedited care something for which we were very thankful. Six weeks and four surgeries later I was finally to the next step. Another lesson learned: Early detection means less surgery and easier treatment options. Don’t be like me. I told Bob, chemotherapy takes you to the brink killing off all the cancer cells and then hopefully your healthy cells take back over. It’s rough. But I didn’t feel any different. I wasn’t sick. At least not initially. The effects of chemotherapy are cumulative. Some of the medicine used is so toxic they have to make sure your heart can tolerate the damage it will do. Some of the effects are long lasting. But with newer treatment methods and better pre-chemo medicines the therapy is tolerable and the staff makes sure your body is well enough to handle each dose. In my case the nurses told me my hair would fall out. They guaranteed it. It depends on what drug is being used but they were right. Within two weeks I looked like a Chinese Crested Dog. I held on to the little hair I had until it finally dawned on me that bald was a much better look than tufted. After sixteen grueling weeks I did finish. 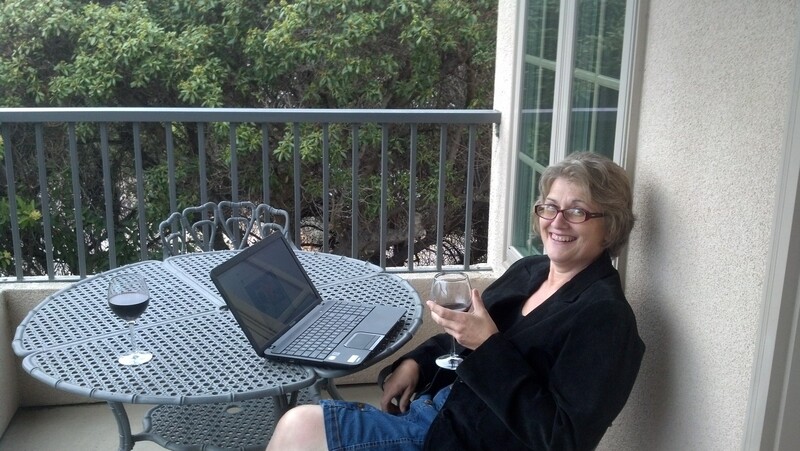 Then it was time to jump right into six weeks of radiation therapy. Another lesson learned: if the tumor is small and if you don’t have any spread of the cancer there are much simpler radiation treatment options including one that only takes a week. The surgeon never did give me much hope for that treatment because the tumor was too big and it had spread to the lymph nodes. Yes, this is me. Poster child of what not to do. No hair, sad puffy face. Toxic chemo drugs running in. Ugh. So, for gosh sakes, don’t be like me. The radiation therapy was fast and definitely easier to handle, which is not to say it was without challenges. Basically it’s like you are sitting out in the sun for hours on end. Depending on the location of the tumor a person would have more or less burns. Mine were mighty. You could still see the redness a year later. Along with the radiation burns comes scarring. I still have to consciously s t r e t c h the muscles in my affected arm. They don’t move like the other side. Nearly eight months after finding the lump I was finished with treatment. Eight months of my life gone in the blink of an eye. You can’t beat yourself up for ‘should‘ve, would’ve, could’ves’. But I know it’s hard not to. Sure I wish I’d done things differently but I expect the Good Lord above had some plan in mind. After all, caring for a sick mother really worked out well when it came time for Rebecca’s life story in her medical school application. Who knows. Enough of that. Let’s skip forward a few years. Just imagine that I had MRI’s regularly and in my claustrophobia induced panic pushed the RED EMERGENCY button more than once and know that once these doctors get hold of you they don’t let go so visits to the clinics, doctors and labs continued until today. Here we are today. Five years is no longer the magic cure length of time. But it is a major milestone. I no longer have to take the chemo pills that make my head feel like it’s being held on by a toothpick. Mammograms and the cancer check labs are finally annual. And with this new schedule I don’t expect to see the chemo doctor again after December. Still, there is no doubt that always in the back of my mind is the idea that the cancer could come back. This has been a life altering change. Earlier detection certainly would have made it less impactful. So what’s your take away if you managed to read this far? Two things, I hope. 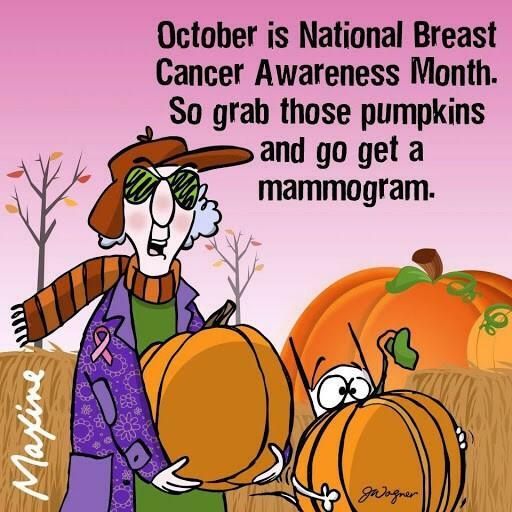 The first, that if you are a woman or know a woman who reaches the age of 40, get that screening mammogram. Don’t let your mother tell you she’s too busy. Don’t let your sister slide on this just because you have no family history, remember I did not. Don’t put yourself at the bottom of the priority list. YOU are IMPORTANT. Take care of yourself. And secondly, there is hope. You can have a mass that is 2.5 centimeters that has spread and survive. The doctors told me at each step what my odds of survival were. Each point improved my odds; I had surgery, if I had chemo and each different drug’s impact, if I had radiation, etc. Modern technology is amazing. I don’t know where they put prayer on that list but when our friend invited the family down to the altar and prayed with us and I felt a peace wash over me. Take it to the Lord. Prayer is powerful and I recommend adding it to your arsenal. Along with that hope is where we are today. Physically I don’t need those naps anymore and have energy to work on all the projects that piled up, though my list still is long. Each morning we walk on the treadmill. When I say we I mean Matthew and I take turns. He walks 2.5 miles and I walk 5 or 6. He has trimmed down to a lean fighting weight…me, well, I’m still ‘full figured’. I blame the chemo. In fact, I blame the chemo for every health issue I now have from having thin hair to a short memory. Is it unfair? Probably, but too bad. I can still garner sympathy points with my family and you bet I use them. And that’s my story. As Breast Cancer Awareness month comes to an end you can now say that you know far more than you ever wanted to know about one woman who putzed around and didn’t get her tests done in a timely fashion and ended up being put through the wringer due to her own negligence. But that you also know she managed to scrape and crawl her way back out of the dark hole and today she sees every sunrise as a fresh chance to begin a new chapter. And for crying out loud don’t let a year pass without pestering your mother, sister, aunt to have her mammogram. I hope Maxine doesn’t mind that I borrowed her picture.